Today’s post marks the second birthday of Settling Scores. I have been having altogether too much fun with it, and I’ve met all sorts of interesting (and interested) people. Some were names I knew professionally, but very many have been entirely new. I am gratified by the response, even if I am sometimes completely in the dark on the reasons why some posts take off and others fall comparatively flat. Although when I started this project I had a long list of issues I wanted to cover—and that list remains long—I never imagined I would spend a post on bar numbers. What could there possibly to say? The bars are numbered! End of story! But just a few weeks after I began blogging, I knew eventually this post would happen. It was prompted by a post on the blog put out by the G. Henle Verlag. Henle urtext editions have dominated the market (particularly for piano students) in the USA for as long as I can remember. You’d know those slate blue covers anywhere, even if they have updated the look a bit over the years. Their blog comes out every two weeks, written by their house editors in rotation. It offers a fascinating behind-the-scenes glimpse at editorial work in progress. Although in the preface editor Peter Jost goes to some pains to point out that the piano reduction published as the first edition in 1868 was not by the composer (but rather his pupil, Adam Laussel), the Henle blurb above gets this wrong. SOURCE: scan of 1875 Durand edition from 1995 Dover reprint. SOURCE: scans of the autograph score, F-Pn Mus. MS-488, fully available here. 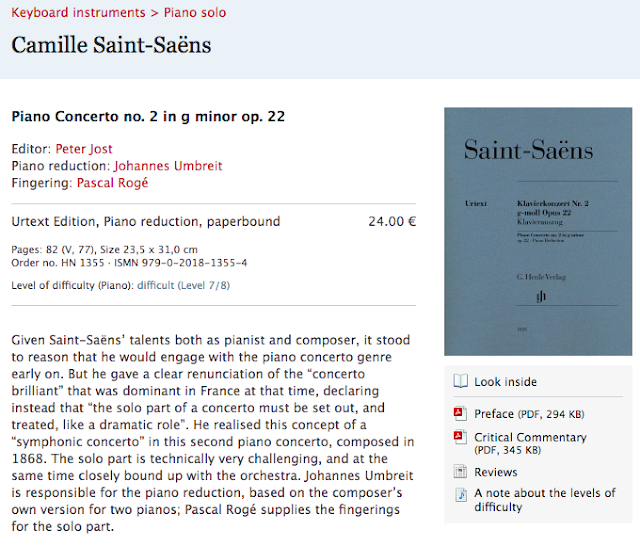 In this example, I have taken the images not from the Bibliotheque Nationale site, but rather from the Henle blogpost. This has required cropping them to display them appropriately: Henle inaccurately represents p. 2 abutting p. 1 (as if recto facing the preceding verso), although it really should abut p. 3, as above. 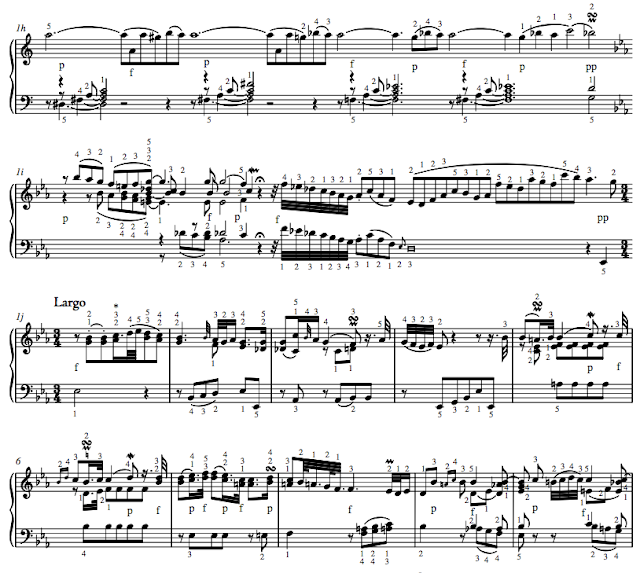 Jost points out that Saint-Saëns numbered the measures of this movement, starting with the orchestral entrance. Thus the “prelude” is unnumbered—although it isn’t entirely unmetered, and even concludes with ruled bars. Jost follows the composer on this, yielding a movement of a prelude plus 112 bars. The first edition lacked measure numbers, but had rehearsal letters. Sabina Teller Ratner’s thematic catalogue of Saint-Saëns works gives the total number of measures in each movement, and thus in this case numbers from the beginning, with the last bar as number 115. (Her bar 11 below is Jost's bar 8. I do not understand the value of Mr. Jost’s “return” to the composer's “original numbering.” We don’t know enough to understand whether those numbers were intended to mean anything at all. Was Saint-Saëns making a philosophical statement about the music (as Mr. Jost inevitably is—some music designated as “preceding” the real piece)? Was there at that moment nothing written on the preceding pages, with the composer planning to improvise an introduction based on material that appears later in the movement—eventually codifying it as text? I exchanged e-mails with Mr. Jost in the days following his post, but came away unsatisfied. As I see it, bar numbers serve one principal and practical function: orienting the user in a score. A bar number is a coordinate used to locate something. It need not be anything else. 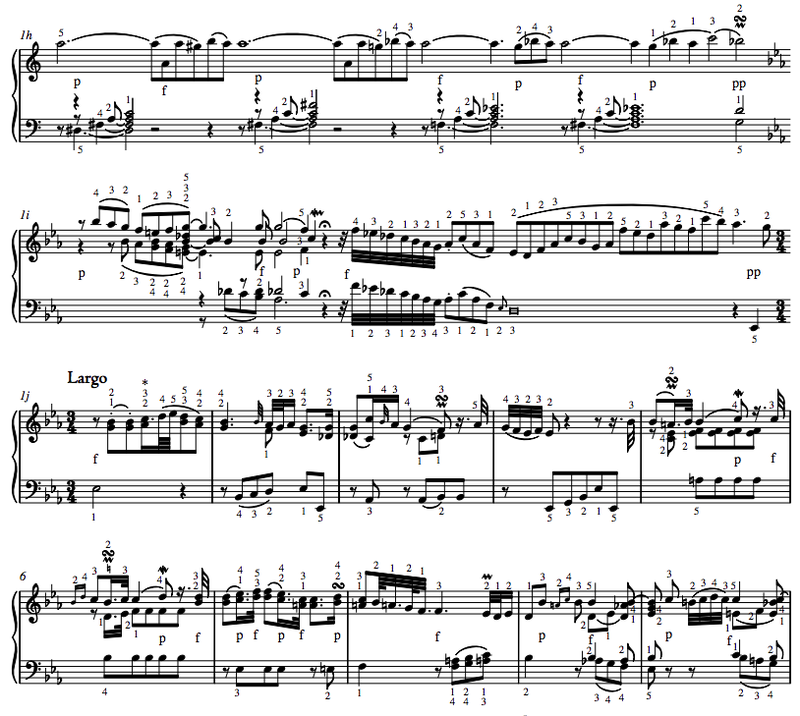 For any music requiring more than one player, numbered bars are useful in rehearsal (“We’ll start in bar 63”), where the system is more precise—and arguably less cumbersome—than rehearsal letters (“We’ll start six bars before F”). In Jost's edition, taking it “from the top” is not the same as from bar #1, and that may lead to some confusion. Source: cropped scan of Carl Philipp Emanuel Bach: The Complete Works, Ser. I, Vol. 3 (ed. David Schulenberg, 2005); detail of p. 34, the fantasy from Wq 63 no. 6. SOURCE: cropped scan of Mozart: Klavierstücke (HN 22, ed Ullrich Scheideler, 2006), p. 66. Incredibly, this same work—newly edited by Mr. Scheideler—appears in the same new volume as the modulating prelude (HN22) with the bar numbers allocated exactly the same way as in 1955, so the new volume itself is insconsistent. The Neue Mozart-Ausgabe isn’t much better in this respect: K. 394 is treated as above (although the Henle and NMA bar numbers do not correspond); other works in the volume, including the modulating prelude, use the a... b... c... system as in the C. P. E. Bach edition. For a particularly interesting situation, see the NMA’s presentation of K. 284a [NMA IX/27/2, pp. 5–9]; bar “(25)” is my favorite. Does any of this really matter? It depends, of course, on whether a number is merely a milepost or whether it has any substantive meaning relating to the music. Once you start disconnecting the numbers from the sequence of bars on the page you surely must mean something. I looked to see what the Hallische Händel-Ausgabe does with those passages in the organ concertos in which they have interpolated Wolfgang Stockmeier’s “suggestions” of how to improvise in response to Handel's instruction “ad libitum.” I, for one, don't think such interpolations belong in that sort of scholarly edition, but at least the editors had the good judgment to leave those bars unnumbered (and in small type): Handel didn’t indicate how many bars to play, and neither should the HHA. When I began work on my first editorial project—Walton’s Variations on a Theme by Hindemith for the William Walton Edition—I remember starting by numbering the bars and assuming that it would be a straightforward task (young and callow as I was). The anxiety that awaited me! I wanted to number the bars sequentially across all the variations. In a way, this was a substantive statement: it meant essentially the whole is greater than the sum of its parts. But really there was a practical reason for this: the critical commentary would be much harder to use if you had to keep track not only of the bar number but also of the variation number. When I set to work, however, I found that Walton had paid no attention to the seams between the variations. 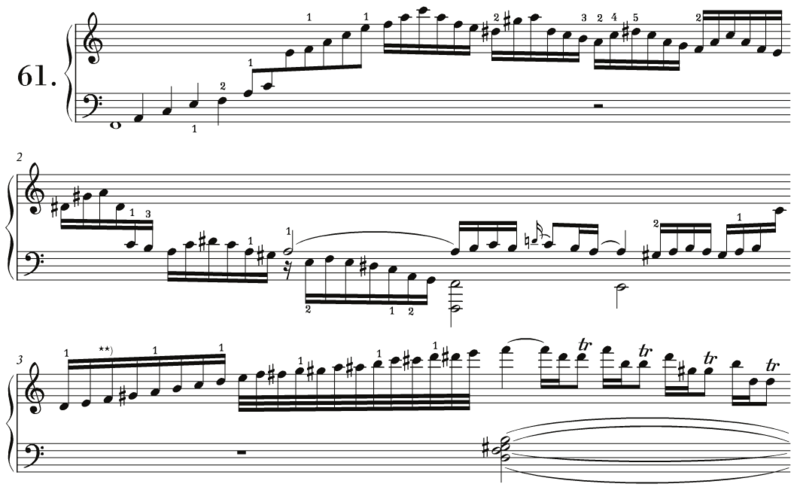 This might be because he would send off a completed variation to his publisher before starting another, but it is just as likely that he didn’t care if a complete final bar of one variation was followed by a pick-up bar of the next. In many musical editions, “bar number 1” is the first complete bar rather than the first thing on the page—but I found I would have to count each of these incomplete tags at the beginnings and ends of variations as full bars if I wanted to have just a single numbering system for the whole piece. It worked, but I still don’t like the look of it. How orchestras survived for so long without rehearsal marks I can’t imagine, and at least those who attempt historically-informed-performance are not bound to historical rehearsal practices. (The unions would never stand for it.) I bristle against heavy-handed editing, when the editor goes out of the way to make a mountain out of a molehill. Herr Jost’s treatment of the Saint-Saëns strikes me as just that. Then again, this blog is made entirely out of molehills treated as if they were mountains, so I’m one to talk.